Whether you’re a student heading home for the summer, a business looking to make some extra space in your office, or a homeowner planning a house move, Metro Self Storage have the self storage solution for you in Islington, Central London. At Metro Self Storage we make getting the extra space you need simple. Our storage unit costs are kept affordable, with flexible contracts, simple pricing and easy access. You can be sure that your belongings are safe at our secure self storage site in Islington, N1. Up to £14,000 Free Insurance – Giving you complete peace of mind. Open Every Day – Access your unit as often as you like, 7 days a week. Pre-Payment Discounts Available – Save up to 15% per year! We understand that your self storage needs can change and as time goes on you may need less space, more space or no space at all. That’s why we offer flexible contracts that give you the freedom to upgrade, downgrade or cancel at any time with just 2 weeks notice. So you can be sure that you’ll always have the space you need and not end up paying for space that you no longer want. At Metro Self Storage our fair and transparent pricing policy means your initial quote includes everything you need, from VAT to insurance, and even a padlock! So the price you are quoted is the price you’ll actually pay for your self storage unit. You won’t find any hidden fees or surprise invoices here! 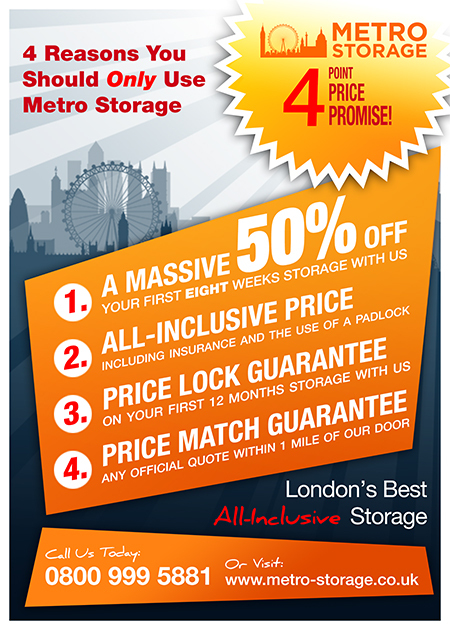 Finding good self storage in Central London can be tough, but at Metro Self Storage in Islington we’ve got all you need. 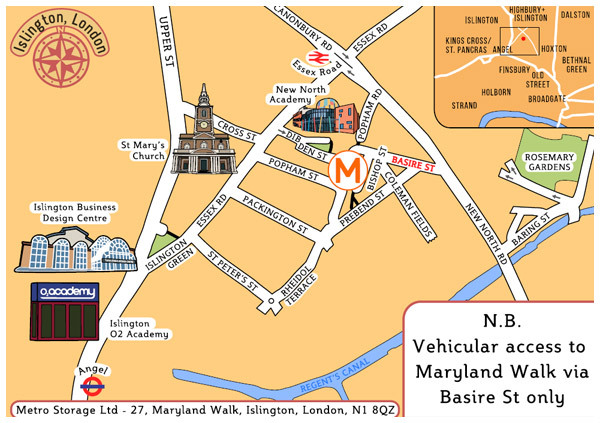 Our Islington storage unit site is located on Maryland Walk, N1 and has a large range of unit sizes to choose from. Complete with its own onsite parking and just a few minutes walk from Essex Road, Islington & Angel stations, it’s easy and convenient to get to by car or on foot. We’re open 7 days a week, Monday to Friday 8am to 8pm, Saturday 9am-6pm and Sunday 10am to 4pm. So you can access your unit as often as you like. There’s no need to let us know when you’re coming. Just turn up, bring your key and let yourself in to your unit. We are just off Essex Road and New North Road. When you find Basire Street, head for the top corner of the road where it takes a sharp turn by the school. You will find the entrance to Metro Storage on this corner (look for the flags and sign!). Walk down the ramp and the entrance and office are right there. If coming by car, van etc. you will need to approach Basire Street from the New Road North (A1200) end of the road. Turn into the street and drive up the gentle hill towards the sharp right hand corner in front of the school. You will see a ramp on your left hand side which is painted white and orange (and has signs and flags!). You can drive onto the ramp where there is ample parking right by the entrance to the store. Choosing the right size self storage unit for your needs can be tricky. Whether you’re creating more space in your business or packing up your whole house, it can be hard to work out just how much space you will need. Go too small and you risk not being able to fit all your stuff in your unit. Go too big and you’re wasting money on space you don’t require. But don’t worry. 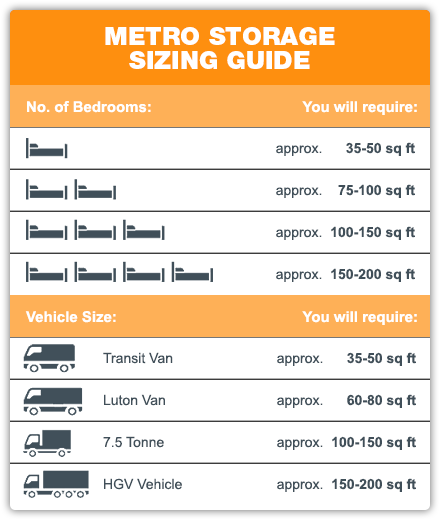 Our handy storage size guide will give you an idea of what each storage unit size can hold. But if you’re still not sure what size self storage you will need, just give us a call or pop in and we’ll be happy to help. We can show you some of our available units and help you to find the right storage size for your needs. If you get it wrong there’s no need to stress. Our flexible contracts mean you can upgrade or downsize whenever you want to, so we can always change to a size that suits you. Need A Little Help Getting Moved In? Whether you’re planning a house move, expanding your business or getting ready for a trip around the world, we can make getting moved in to your storage unit easy and hassle-free. Our “Easy Move” bundles have been designed to take the stress out of your move, giving you everything you need, from packaging, a packing service and bubble wrap, to a man and van to do the heavy lifting, at a single, affordable price. Just give us a call on 0800 999 5881 and we’ll take the stress out of moving day.